Today, there are loads of notifications on our mobile phones, especially from the numerous social media apps craving to have a bite on our 24 hours per day. In order for us to catch up with the entire buzz, we snap out half-baked sentences and half-hearted conversation. Recently, I had a conversation with a friend on this struggle and we found out that there are 5 amazing benefits of chatting on the phone that we are all missing out on. Here is the conversation. The name of my friend is J.
Fash: Why do you abbreviate all your written words? J: I know it is sheer laziness that’s why I abbreviate alot whenever I write. Fash: Really? Is that your only reason? J: Then, it is easy and it helps me type faster. I have to attend to many chats and notifications on my phone. Fash: While it is easy for you, but I don’t understand your sentences. The essence of our conversation is defeated. Why don’t you learn the short-hand or sketch-noting? J: Both are difficult to learn and many people don’t know about it. That’s my problem. J: Yeah, I do. Sincerely, I want to improve on my writing and communicating skills. Fash, what do you think I can do about this? Fash: Let me suggest a simple discipline about chatting. Put your numerous thoughts in short concise format. I wrote 150+ posts from scratch in 2015 while commuting to work through this same method. I use the sticky note app on my phone to write out the thoughts as they come and develop later on into a full blog post. I learn 5 new words and poetic phrases everyday using the famous Merriam-Webster Dictionary on my phone. During my chat sessions, it helps me to find a use for the new words in my word-bank. So, I chat and still learn at the same time. Great! I know that there is an economic value to being able to type fast, since I can’t carry my computer everywhere, I decided to use QWERTY keypad on my phone to chat. It is synonymous to using the same keyboard on the computer. This has boosted my able to type faster in the last 5 years. To engage people intelligently without seeing them face to face. Is it possible to see through someone’s emotions simply through chats? Yes! In fact, I have done coaching and training through mini-chats that produced results. There are no limits to what can be achieved through chats if you put your heart to it and make it work in your favour. Practical Action: Dear J, I want you to get one of your friends that is committed to your personal growth. Tell him/her to help you to consciously write in full whenever you chat for the next 30 days. Result: 4 of my friends got committed into this in the last 30 days with me, we have all improved amazingly, no more abbreviation and wrong construction of sentences. 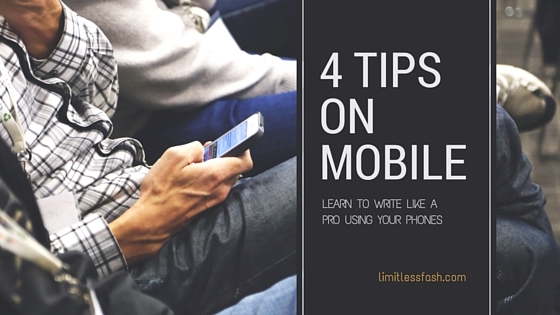 In the comment box, tell me other innovative ways you have been using to improve your writing via your phone.